In this article, we will discuss how to handle SQLExceptions that encounters during an interaction with a data source. A description of the error - Retrieve the String object that contains this description by calling the method SQLException.getMessage. A SQLState code - These codes and their respective meanings have been standardized by ISO/ANSI and Open Group (X/Open), although some codes have been reserved for database vendors to define for themselves. This String object consists of five alphanumeric characters. Retrieve this code by calling the method SQLException.getSQLState. An error code - This is an integer value identifying the error that caused the SQLException instance to be thrown. Its value and meaning are implementation-specific and might be the actual error code returned by the underlying data source. Retrieve the error by calling the method SQLException.getErrorCode. A cause - A SQLException instance might have a causal relationship, which consists of one or more Throwable objects that caused the SQLException instance to be thrown. To navigate this chain of causes, recursively call the method SQLException.getCause until a null value is returned. A reference to any chained exceptions - If more than one error occurs, the exceptions are referenced through this chain. Retrieve these exceptions by calling the method SQLException.getNextException on the exception that was thrown. SQLWarning objects are a subclass of SQLException that deal with database access warnings. Warnings do not stop the execution of an application, as exceptions do; they simply alert the user that something did not happen as planned. For example, a warning might let you know that a privilege you attempted to revoke was not revoked. Or a warning might tell you that an error occurred during a requested disconnection. 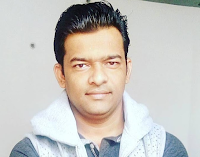 The most common warning is a DataTruncation warning, a subclass of SQLWarning. All DataTruncation objects have an SQLState of 01004, indicating that there was a problem with reading or writing data. DataTruncation methods let you find out in which column or parameter data was truncated, whether the truncation was on a read or write operation, how many bytes should have been transferred, and how many bytes were actually transferred. BatchUpdateException is thrown when an error occurs during a batch update operation. In addition to the information provided by SQLException, BatchUpdateException provides the update counts for all statements that were executed before the error occurred. 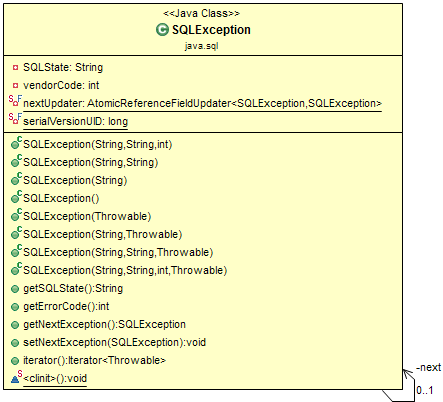 SQLClientInfoException is thrown when one or more client information properties could not be set on a Connection. In addition to the information provided by SQLException, SQLClientInfoException provides a list of client information properties that were not set.